"An authentic Iranian dish featuring boneless lamb in a marinade of garlic, lime, and saffron. Serve hot with plain rice (polow or chelow) or on Middle Eastern bread." Combine olive oil, lime juice, onions, garlic, saffron, salt, and pepper in a large, zip top food storage bag. Place lamb pieces in bag; seal and shake to combine. Marinate lamb, refrigerated, overnight or up to 24 hours. Thread marinated lamb on long, thin metal skewers. Thread whole tomatoes on another skewer. 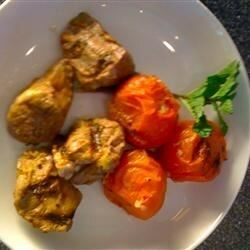 Brush lamb and tomatoes with marinade; discard remaining marinade. Grill kebabs, until lamb is cooked to your liking and tomatoes are hot and grill marked, about 5 minutes on each side. Sprinkle with sumac, if desired, before serving. If you're serving this with rice, sprinkle with ground sumac, if desired. The marinade is delicious with grilled chicken breasts.